CCTV: A still taken from Cawley’s Commercial. At the bottom of the picture, men can be seen taking diesel from a parked lorry. GARDAI in Sligo are investigating an incident where diesel was siphoned from lorries. It is understood that diesel was siphoned from trucks at Cawley Commercials in Sligo, who released still shots taken from CCTV footage. From the pictures, a group of men can be seen applying an apparatus to a parked lorry to extract the fuel. Also, a white Ford Transit van can been seen parked some distance away from the lorry as the incident unfolded. Cawley Commercials issued a statement via their Facebook page which detailed the incident. “Last Saturday morning [January 19] at 4.30am we had diesel stolen from a number of trucks at our workshop,” they said. They go on to explain that three men were at the scene with the white Transit van. Meanwhile, gardai in Sligo have appealed to business owners to be vigilant. 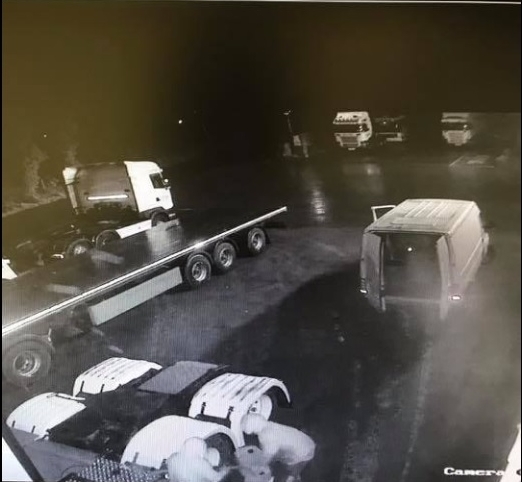 “We are asking business owners to be vigilant following an increase in thefts involving ‘siphoning of fuel’ from HGVs and trucks,” they said this week. They have urged anyone with information regarding the taking of fuel to contact them at Sligo Garda Station on 071 91 57 000.